Behavioural approaches take the view that behaviours are learned and continue to be used because they are rewarding for a child. These approaches can inform early interventions and behaviour modification strategies. 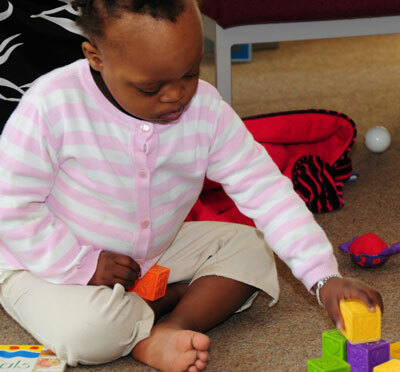 Research suggests these approaches can be helpful for children with Down syndrome. Kathleen Feeley, Emily Jones and their colleagues in the USA are leading this work. In a series of studies, they have focused on teaching infants and young children from 7 months of age communication skills including imitating verbal sounds, requesting a toy and question answering using behavioural approaches. The behavioural intervention approach defines the behaviour to be learned very precisely (e.g. a specific sound), sets up multiple opportunities to learn the behaviour (repeated practice), and uses shaping (rewarding approximate attempts as child is progressing towards goal behaviour), prompting (helping child achieve target with full or partial help) and reinforcement for the child (rewarding attempts and successes with praise or toy). It also involves careful measurement of change. This team have chosen to teach imitation and requesting to infants and toddlers as these have been shown to be relative weaknesses compared to social interactive skills for children with Down syndrome. Recognising that later development progresses by building on earlier acquired skills, they suggest that addressing verbal imitation and requesting at an early age may reduce some of the later communication delays (delayed expressive language and poor speech clarity) reported for children with Down syndrome. 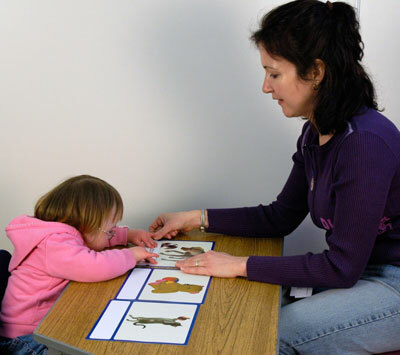 In a series of case studies the team has shown that their behavioural approach can successfully teach verbal imitation and requesting very early (7-15 months) and that infants and toddlers then generalise what they have learned (imitate new untaught sounds, request other objects) and may show improved problem solving. [1-5] The group have also proposed that a behavioural approach can be used to teach exploratory motor behaviour. A principle tenet of the behavioural approach is that behaviours are learned and continue to be used because they are rewarding for the child. This means that a behaviourist will start from the view that a child learns and repeats an unwanted, difficult or challenging behaviour because they get a reward for doing it - for example; they gain attention, avoid something they do not want to do or provoke a reaction (control another person's behaviour). In a series of case studies Kathleen Feeley and Emily Jones illustrate how effective a behavioural approach is to changing unwanted behaviours in young children (dropping to the floor, avoiding learning situations and throwing materials to floor, making noises, unwanted hugging). [7-9] Key to success is careful observation of the child and the behaviour to identify when, where and how often it occurs so that the reasons (rewards) can be identified, planning a change programme with everyone involved with the child and building new skills that may be needed so that the child does not have to resort to behaviours that are disruptive. Their work also makes clear that some behaviours are linked to background or setting events such as poor sleep and they identify ways that reducing demands on a child who is tired can avoid disruptive behaviours. The papers from this team demonstrate that change can take place quickly if behavioural approaches are used and that the change will last. More research studies and case studies are needed to extend the work that they report and the biggest challenge is to develop accessible training in behavioural methods for teachers and parents. However, there is a large body of knowledge on training parents and practitioners in the autism field which can be drawn on. While it is important that parents and those working in early intervention and preschool services are trained in behavioral methods, they are equally important to delivering effective education through the school years. Parents and practitioners are using behavioural approaches to teach children new skills. Parents and practitioners are using behavioural approaches to change and to prevent unwanted or challenging behaviours. Bauer, S. M., & Jones, E. A. (2015). Requesting and verbal imitation intervention for infants with Down syndrome: generalisation, intelligibility and problem solving. Journal Developmental and Physical Disabilities 27:37-66. Feeley, K. M., Jones, E. A., Blackburn, C., & Bauer, S. M. (2011). 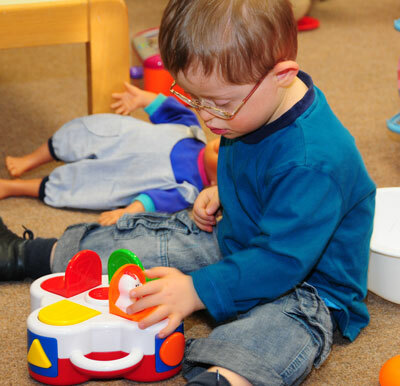 Advancing imitation and requesting skills in toddlers with Down syndrome. Research in Developmental Disabilities, 32, 2415-2430. Bauer, S. M., Jones, E. A., & Feeley, K. M. (2014). Teaching responses to questions to young children with Down syndrome. Behavior Interventions, 29, 36-49. Bauer, S. M., & Jones, E. A. (2014). A behavior analytic approach to exploratory motor behavior: how can caregivers teach EM behavior to infants with Down syndrome? Infants and Young Children, 27, 162-173. Jones, E.A., Neil, N. & Feeley, K. M. (2014) Enhancing learning for children with Down syndrome Chapter in R. Faragher and B. Clarke (Eds. ), Educating Learners with Down Syndrome. (pp 83-116) Routledge Education.